— Coughing up blood is when a person coughs up blood, either by itself or mixed with mucus. When mucus has blood in it, it can have streaks of blood, or the mucus can turn red or pink. The term doctors use for coughing up blood is “hemoptysis.” Coughing up blood can happen in adults and older children, but it is uncommon in young children. When a person coughs up blood, it usually means the blood is coming from their airways or lungs (figure 1). In other cases, blood from the nose, mouth, or stomach can drip into the throat and be coughed up. People can often feel where the blood is coming from, but not always. If a person coughs up a lot of blood, doctors call it “massive hemoptysis.” This can be a medical emergency. 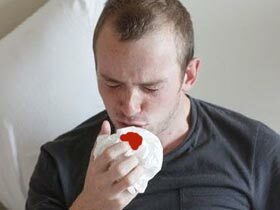 This article discusses coughing up blood that is not a medical emergency. What causes people to cough up blood? ●Bronchitis – Bronchitis means inflammation of the bronchi. 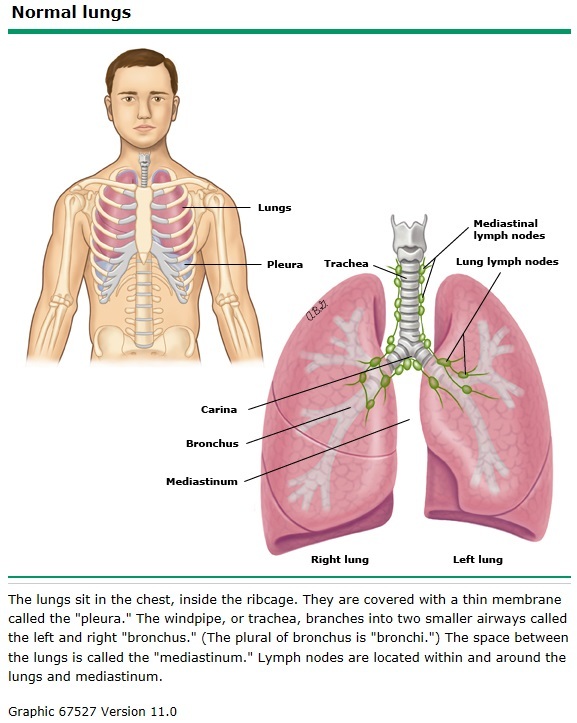 The bronchi are the tubes that carry air into the lungs (figure 1). There are 2 types of bronchitis. “Acute” bronchitis is an infection of the bronchi. “Chronic” bronchitis is a condition in which the bronchi get damaged, for example by cigarette smoking. ●Bronchiectasis – This is a condition in which the airways are damaged and get infected easily. It has different causes. ●Having an object or piece of food stuck in the airway. The object might be stuck for days or weeks before a child starts coughing up blood. ●Bronchiectasis – In children, this is usually caused by “cystic fibrosis,” a condition some children are born with. Cystic fibrosis causes thick mucus to build up in the lungs, which leads to frequent lung infections. — Yes. Any time you or your child coughs up blood or mucus mixed with blood, call the doctor right away. Let the doctor know if you remember seeing your child choke on something, even if it was days or weeks ago. If you cough up a very large amount of blood (about 1 cup or more), or have trouble breathing, call for an ambulance (in the US and Canada, dial 9-1-1). Will I need tests? — Maybe. Your doctor will ask about your symptoms and do an exam. Based on your symptoms and other factors, he or she might do tests. These tests can help your doctor or nurse find out why you’re bleeding and where the bleeding is coming from. ●Lab tests – These might include tests of your blood or a sample of the mucus you cough up. ●Bronchoscopy – This is a procedure in which a doctor uses a thin tube (called a “bronchoscope”) to look inside your airways. ●A CT scan – This is an imaging test that creates pictures of the inside of your body. Is there anything I can do on my own to stop coughing up blood? — Yes. If you smoke cigarettes, the most helpful thing you can do is stop smoking. If you take a medicine that keeps blood clots from forming (a “blood thinning” or “anti-clotting” medicine), let your doctor know. He or she might change your dose. For teenagers and adults who have small streaks of blood in their mucus, a doctor might suggest trying an over-the-counter cough medicine to control the cough. But do not give any cough or cold medicines to young children. These medicines are unlikely to help and can have serious side effects in young children. — If your symptoms are mild and you have had a normal chest X-ray, you might not need treatment.